One thing I love about blogging is the wonderful events and conferences I have been able to attend. They're great for networking with brands, bloggers and all the experts in the field. For learning about all things blogging, whether it's photography, SEO or writing - I have learnt an awful lot from attending some fantastic events. This year I'm hoping to attend Britmums Live as I have never been before and it looks fantastic (hopefully I can find a sponsor in time!). Over the last four years I have been blogging, I have picked up some useful tips in order to make the most of these conferences. I have said this before but I will say it again! Blogger Business Cards are a must. During one conference you can meet dozens of people and if I want to connect with them at a later date, I find having their business cards the easiest way to remember and find all their details. There are some great guides out there to help you on your way to make the perfect business card including a fantastic one from Staples. I love some of their sleek designs and they are sure to help you stand out from the crowd. Useful things to include are blog name, website, email, some social media handles & slogan that indicates what you're about. It is probably a good idea to take along a camera, extra memory cards and batteries and perhaps even a tripod. No end of times I have ended up running out of battery, especially if I'm doing any videoing. Unfortunately, I have had to learn the hard way, but now I always make sure I have (a fully charged) spare battery pack in my kit. I also like to take a notepad and pen and sometimes my Ipad too. It's a great way of keeping all those tips you've learnt safe, so you can go over at a later date. My Ipad has come in handy when wanting to check out brands/people further online without having to risk draining my precious phone battery! This is something I think all bloggers who are regularly working with brands should have. It's an easy way to give a nice overview of what you're about, including all relevant social media links & stats. It's a wonderful way to highlight all the great things you can offer a brand. Whilst these are usually kept paperless, it might be a nice idea to get them printed if you get into talks with brands you are looking to work with. I have to admit, I do sometimes end up taking quite a few things, notepad, pen, iPad, camera, purse, phone & makeup, so I need a nice large comfortable bag to keep it all in. Plus you end up picking up leaflets, business cards and sometimes the odd goodie bag, it's great to make sure you have some extra space to fit this all in so you're not laden with lots of bags. Ok, so the fashionista's out there may disagree, but comfortable shoes are a must. Attending blog conferences usually end's up being a long day. I'm based in Norfolk and most events are based in London, which means a long train journey, numerous tube journeys, lots of walking & standing around, all of which I'm not about to do in my high heels. Of course I still want to look stylish, at the end of the day as a blogger you're representing your own "brand", but this can be done whilst remaining comfortable too! 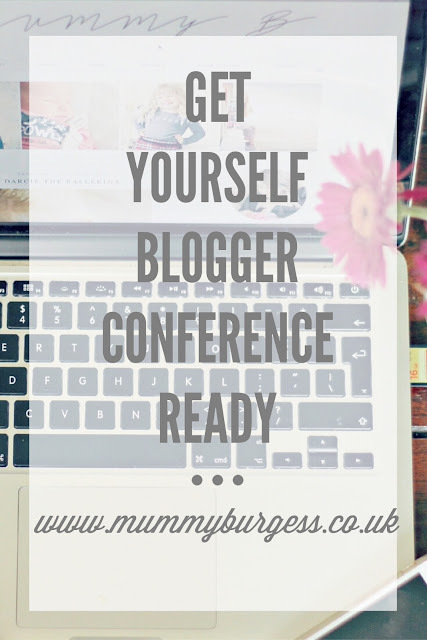 Are you attending any blogging conferences this year? Do you have any of your own tips?